Vegetable Shrimp Stir fry with an incredible sauce takes less than 30 minutes to prepare. Make it ahead and it is perfect for healthy meal prep. Vegetable Shrimp Stir fry is one of our favourites after Prawn Curry and this Garlic herb Shrimp Vegetable Skillet. It is really easy and quick to prepare, I mean that’s the beauty of Stir fry right? The sauce is really delicious and finger licking good. 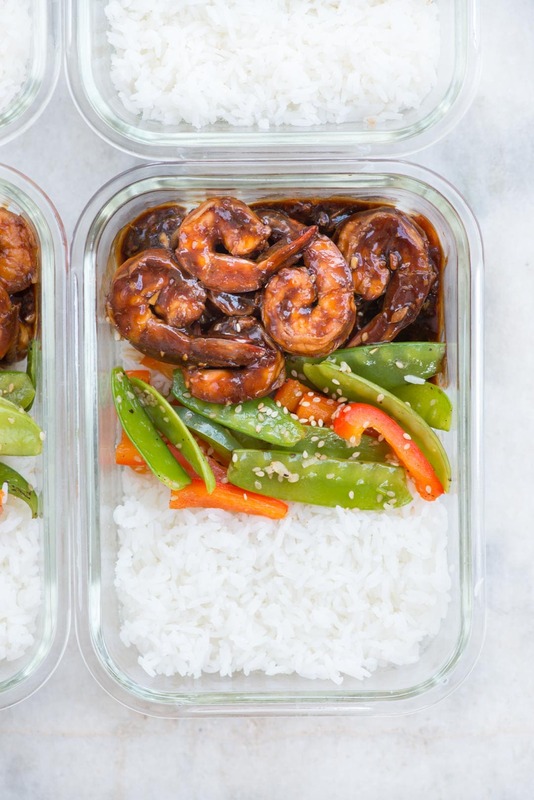 This Shrimp stir fry makes for perfect meal prep. If you had told me to meal prep for a couple of days in advance and keep in the refrigerator, I would have frowned on you. Because I had never seen my mom or my aunt preparing two days lunch, stored and reheated before eating. I have always seen my Mom preparing hot fresh food every single day and serving within an hour of cooking. Hat’s off to her for putting that much of effort to feed us delicious food. And somehow I was pretty convinced that that’s the only way of eating healthy food. Little did I know how cumbersome it is to cook a fresh meal every single day. If you can’t manage to cook at home, you end up ordering from outside. Ordering takeout is far worse than eating a homecooked meal from the refrigerator. Especially after my daughter is born, everything changed overnight. A homecooked meal was a luxury. Though I managed to cook 3 meals a day including my daughter’s, it left me exhausted end of the day. In fact, I hired a cook but none of us was happy. About a year back, I started to plan and do prep work in advance for a meal. And nowadays depending on my schedule, I meal prep for 2-3 days in advance. 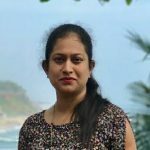 It not only helps me in limiting the number of takeouts but also in weight management. When you have something like this Vegetable Shrimp Stir fry, you wouldn’t mind eating it for two days straight. I don’t share many of my meal preps here on the blog. Should I?? HOW TO MAKE VEGETABLE SHRIMP STIR FRY? 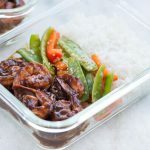 Making Vegetable Shrimp stir fry is easy and really quick. And if you are wondering where are the vegetables in the Shrimp Stir fry picture below, then allow me to explain in the next section. Start with good quality medium sized shrimps. If I get the fresh ones I usually clean, devein and freeze it. You can also use packed one. 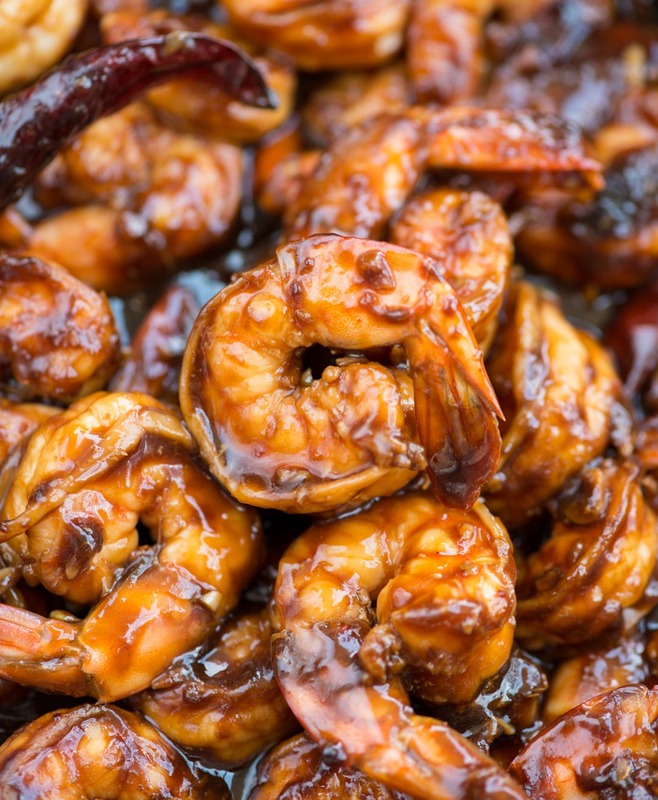 To make it quick, thaw frozen shrimp on the kitchen counter at least for one hour. Start with making the sauce. Mix all the sauce ingredients and check the seasoning. I have observed different brands of Soy sauce has a different salt level and also the intensity. SO adjust the seasoning by adding more sugar to balance the saltiness. I prefer to use freshly minced ginger and garlic, as it enhances the flavours. Using dry red chilli is optional here. I like the smokiness that those red chillies add to the sauce. You can certainly skip it. Now coming to veggies you can use snow peas, peppers, zucchini, broccoli. The reason I have not added the veggies to the stir fry is that I was planning to meal prep this stir fry. 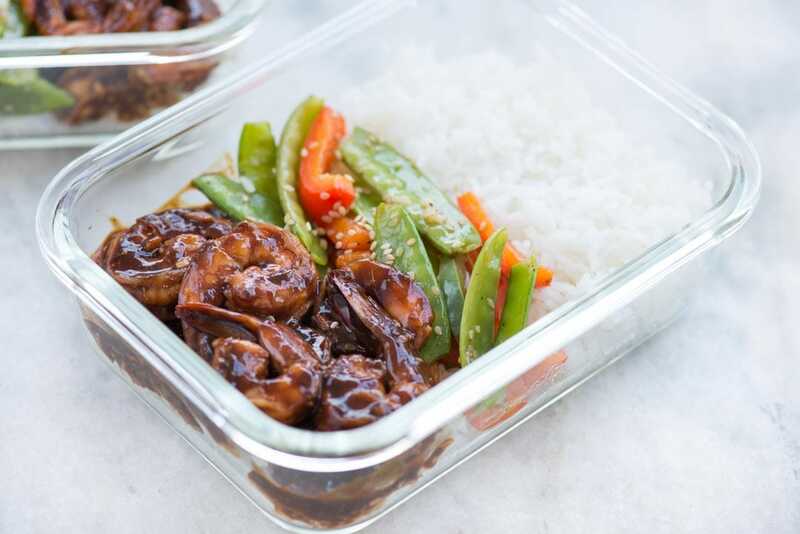 What I have observed is when vegetables mixed with the stir fry is meal prep, all those veggies lose their taste and soak up all the flavour from the stir fry sauce. I was missing the freshness of the veggies. So I stir fried the veggies separately with a dash of oil and garlic. If you are not planning to meal prep the stir fry then toss in the veggies towards the end of the cooking time and cook until cooked. Assembling a lunch bowl is pretty simple and it it is up to you depending on your diet preferences. I like to have a balance of carbs, protein and veggies in my meal. I can’t stress enough if you are into regular meal prepping then use glass lunch boxes. Please don’t use plastic, because it’s not only good from a health perspective, it also changes the taste of food. White rice, Brown rice or quinoa are few of the options for carbs or if you are on low carb diet then cauliflower rice would be the best fit. Make sure the stir fry, rice and veggies have come to room temperature before you pack. I prefer storing each component separately. So that the grains or veggies don’t get soggy because of the sauce. Start with making the stir fry sauce. Add all the ingredients mentioned under stir fry. Check the seasoning. In a wok or a pan add 1 Tablespoon oil. Add minced ginger and garlic. Cook for 30 seconds. Stir in shrimps. Cook for 4-5 minutes stirring in between. 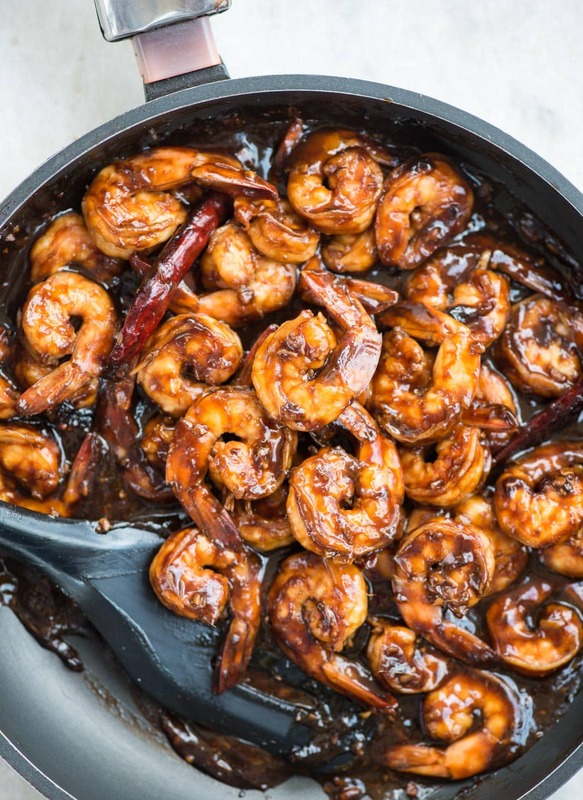 Add stir fry sauce to the shrimp and cook for 3-4 minutes in medium heat until the sauce has thickened and coated shrimps well. In another pan add 1/2 tablespoon oil. Add snap peas and pepper. Stir fry for 3-4 minutes. The vegetables should just be cooked, it should have the crunch. Choose your grain from White Rice/Brown Rice/Quinoa or if on low carb then Cauliflower rice. Divide rice among 4 glass lunch box container. Divide shrimp and stir-fried veggies equally into 4 boxes. Spoon any leftover sauce from the pan over the shrimps in the lunch boxes. Close and keep in the refrigerator up to 2 days. 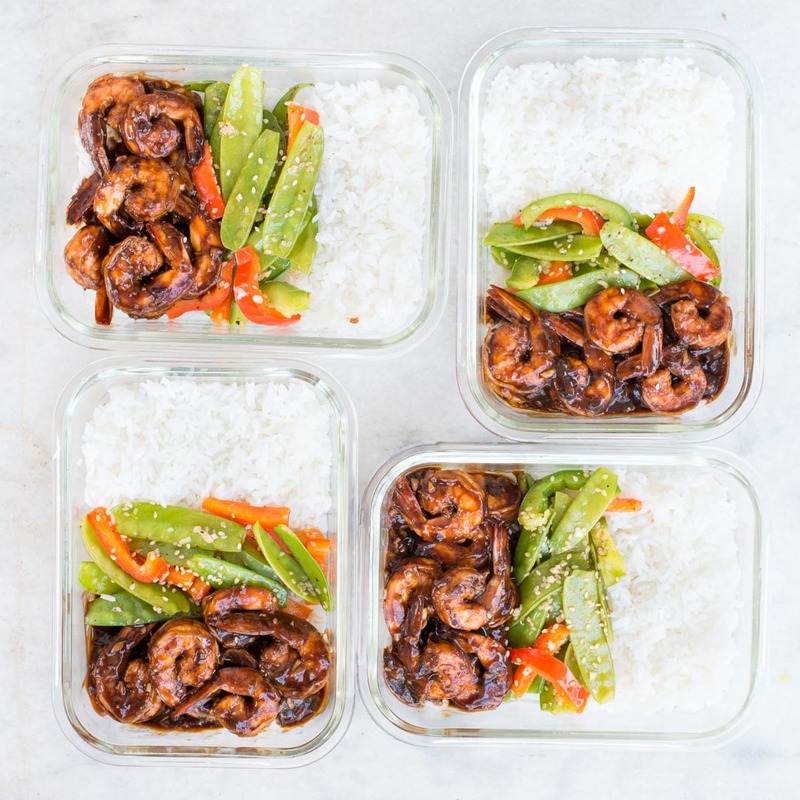 If you are meal prepping the shrimp stir fry, then stir fry shrimp and veggies separately. So that the veggies would retain its taste and freshness even after refrigerating. If serving the stir fry immediately, then add veggies to the shrimps 3-4 minutes before switching off the stove. Reheat in the microwave before having. Once reheated don't refrigerate again.